Today I wanted to share some tips about maintaining medication in your medicine cabinets. In my experience the level of medicines each household requires differs. We tend to be more minimalist in our household. Age and amount of family members will alter what is necessary to have on hand. Day Ten: 40 Bags in 40 Days Decluttering Challenge – Is it really a good deal? We are nearing the end of the second week of the 40 Bags in 40 Days Challenge. Are you still feeling motivated? What are you most excited about accomplishing? 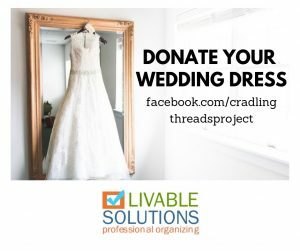 It is day nine of the 40 Bags in 40 Days Decluttering Challenge. I hope you are staying on task with your goals. Today I wanted to send along another resource. Some of you asked about digitizing old movies and photos at the intro workshop and I totally forgot about one of our great local resources. Livable Solutions can scan and digitize photos easily for our clients, but for larger projects, slide conversions, home movies etc. you can use Savage Solutions. It is day seven of the 40 Bags in 40 Days decluttering challenge. Are you staying on track with your schedule? It is hard to stay motivated on days you are tired or busy. Here are some of the daily routines I use to keep order with a young family. It is day four of the 40 Bags in 40 Days Decluttering Challenge. Are you keeping on track? Is it surprising how much longer some areas take than others? I am excited to share one of our participant’s accomplishments. On the first day she sent me photos of her kids craft supply cupboard. It was two shelves but what an impact cleaning out the area had. Everything is so much more accessible. One of our 70+ participants wrote me last night frustrated that they feel like they are spending more time sorting and organizing than purging. I assured her that is exactly what you are supposed to be doing! It can be stressful to think of gifts for all of the loved ones in your life. I came across this list a couple of months ago and saved sharing it for the holidays. It is 100 ideas for gifts that will not increase the clutter in your friend’s and family’s homes. Happy gifting! 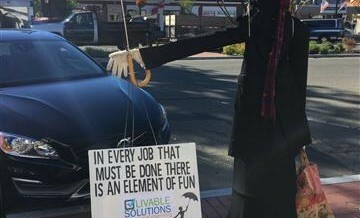 Vote For Livable Solutions in the Madison Scarecrow Contest! We need your vote! Visit the link below to vote for our Mary Poppins Scarecrow in the Madison Chamber of Commerce’s Annual Scarecrow contest.